HTC One S9 expected price in India is ₹32,999. 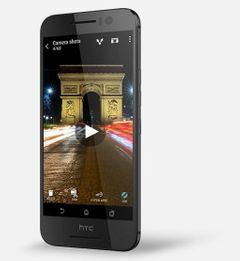 After announcing its new flagship smartphone HTC 10, which is yet to make it to India, the Taiwanese handset manufacturer has once again turned its attention to mid-tier smartphone and has now launched HTC One S9. Currently, it is only listed on company’s official website In Germany. Here's everything you need to know about HTC One S9: features specification and price in India. The HTC One S9 boasts off a 5-inch full HD super LCD (1080×1920 pixels) with 443ppi pixel density and Gorilla Glass protection. At the heart of HTC One S9 enthralls a MediaTek Helio x10 chipset clocked at 2GHz. It is the same chipset which comes fitted in number by budget smartphone including LeEco Le 1s. To handle multi tasking and offer hassle free games experience it is equipped with a 2GB of RAM and PowerVR G6200 GPU. To storage images and other data, the phone has 16GB of internal storage which is expandable up to 2TB via microSD card. The phone is backed by a 2840mAh battery. For shutterbugs, it features a 13-megapixel rear shooter with autofocus, BSI sensor and dual-tone LED flash. On the front, it bears a HTC 4-Ultrapixel with fixed focus and BSI sensor. The 4G-enabled and runs on Android 6.0 Marshmallow with HTC Sense UI on top. HTC One S9 comes with BoomSound technology and Dolby Audio. HTC One S9 supports NFC, Bluetooth 4.1, WiFi, GPS, Miracast and Micro-USB as connectivity options. A list of sensors on the phone which includes an Ambient light sensor, Gyrosensor, Proximity sensor, compass sensor, magnetic sensor Motion Accelerometer, and sensor Hub. There is no official information about the availability of HTC One S9 in India. We expect HTC to make this phone available in India as early as Q2 of 2016. The HTC One S9 online price is EUR 499 which roughly translate to Rs. 33,700. For more updates and price alerts on HTC smartphones subscribe to Smartprix.